If you don't have an Instant Pot, you need one, for this recipe alone. 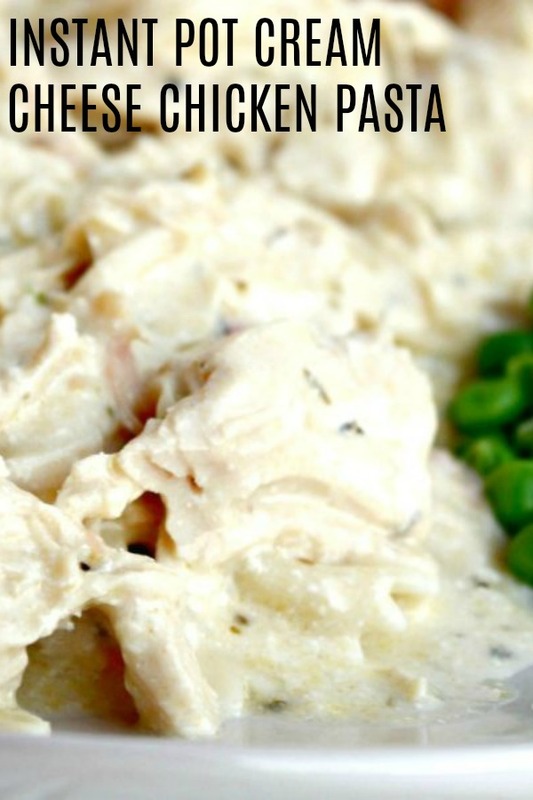 This Instant Pot Cream Cheese Chicken Pasta will change your life. It is so easy to make and comes together in minutes. You are going to love how fast and delicious this recipe is. One of my favorite things about the Instant Pot is that if I have a little time before dinner and need something quick, I just throw things in my Instant Pot and it cooks SO FAST. As a mom, I rarely have time to make a full dinner, with side dishes and all. However, this recipe saves me so much time because I make it in my Instant Pot, and instantly, dinner is ready to go. It’s healthy, delicious, full of flavor, and my picky eaters loved it. It was a win win, for everyone. Also cleanup was a breeze which is always a little blessing, in every mothers life. You could definitely make this recipe in a slow cooker. Make as directed in the instructions, except place it in a slow cooker, on low for 5 hours, instead of in the instant pot. You could also put it on high and cook for 3-4 hours, or until the chicken is cooked through. We recommend using thinner chicken breasts or tenderloins, when making this recipe. Place chicken breasts, broth, soup, cream cheese and dressing mix into Instant Pot. Set on poultry or meat setting or manually set for 15 minutes. While your Instant Pot is cooking, boil water in a pot on your stove and cook your pasta according to the directions on the package. Shred the chicken and serve over the pasta. If your chicken is frozen, add 5 to 10 minutes until your chicken is cooked through. Looks yummy, what about the pasta? Looking for where the pasta comes in, too!! Sorry! I was out of town! Just cook the pasta like you normally would on your stove top while your instant pot cooks! How could I make this using a crockpot? How can we make in a crockpot? This was the first meal I made in my Instant Pot and I followed the directions exactly but the cream cheese was still in chunk and didn't blend when I mixed it. The juice was so watery with chunks of Cream cheese. I was hoping for a thicker sauce. Any Idea what happened? You can reduce the amount of chicken broth and mix the soup, cream cheese, and chicken broth and seasoning with a whisk before pouring over the chicken. That should help if your cream cheese had chunks. I had the same experience! I removed the chicken and set my instant pot to sauté then whisked in 2 TBS of flour with an electric hand mixer to thicken the sauce and blend the cream cheese before I added the shredded chicken back to the pot. It ended up tasting very good, but I thought it was a fail initially. Thank you! I was a little disappointed with my watery sauce but this worked great! I did this as well and it turned out great! Thanks for the advice! Can you use frozen chicken? If so, what should the time be upped to? If using less chicken (2 breasts) should I cut broth in half? 2 cups sounds like it would be watery? I just turned the ip onto sauté and reduced it while stirring the cream cheese. It thickened up and was perfect. Loved this recipe! I cut my cream cheese into small chunks and had no problems. Added a small amount of flour to thicken the gravey and served over rice. Delicious! Any nutrition details? It turned out perfect for me. I did blend every thing before pouring over the chicken. So tender, it just fell apart. Why not cook the pasta in the instant pot at the same time?? Why cook it separately? Has anyone cooked the pasta with the chicken? I've done this with other recipes. After reading comments about it being too soupy, I added noodles to cook with chicken. Came out PERFECT! How do you make it so the soup doesn’t burn in the pot?? It was soo good!! And so quick!! Went from frozen chicken to moist and tender in only 20 min! !♡ It's my new fav kitchen item!! This was my first recipe ever in my IP. My boneless pork came out a little dry. I put on high pressure for 5 minutes. Any advice? Very disappointing. It was chicken soup. It looked very unappetizing on the plate as well. If the sauce would have been thick it would have greatly helped. Directions said nothing about mixing the items together first? The chicken was tender, but I ended up putting the chicken on bread and making chicken sandwiches. It looks like many of the comments are about sauce being too thin. Maybe recipe needs to be altered. I made this for my family tonight and they LOVED it! I cubed the cream cheese and it melted nicely. I served it over spinach noodles (which my kids just think are regular noodles that I dye green for fun) and it was the best combo. Thank you for such a great meal. Also it was only the 2nd meal I’ve cooked in my instant pot=success!! 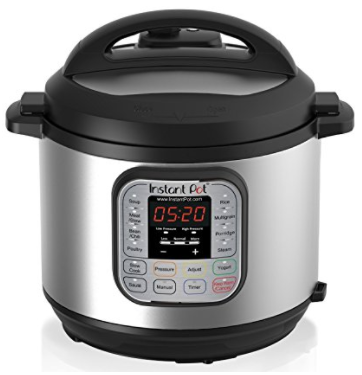 We are so glad that you are enjoying your instant pot. And we LOVE what you tell your kids about spinach noodles! We are definitely going to try this!! Have a great week Holly! Mine came out really liquidy too. I ended up pouring it over rice and it was like creamy chicken and rice soup. The flavor was amazing. Pacific brand has GF cream of chicken soup. I make my own cream of chicken soup to make it GF. 1 cup milk & 2 Tbsp cornstarch whisked in sauce pan. Add in 1 Tbsp butter, 1 tsp chicken bullion, salt & pepper to taste. Whisk while boiling then reduce heat and simmer until thick. Walmart has gluten-free cream of chicken soup. It’s in a purple can I believe and with the canned soups. My son is allergic to wheat and my dad has celiac disease. I have used it several times. Turns out just like Campbell’s. No you use the chicken broth but if you prefer water or any other liquid you can substitute. Mine came out great! The kids went in for seconds. All I did different was put the softened cream cheese in the mixer to make it whipped (which you can also buy) and mixed all the ingredients in the pot then added chicken, PERFECT! And I used no yolk pasta with it. Next I think I’ll add frozen broccoli and the pasta to the pot. I made this for dinner tonight and it was delicious! I used 3 chicken breasts (about 30oz) and used a ranch packet instead of Italian. So good!! It was pretty thin liquid, but just added a couple tablespoons of flour and it thickened up some. My husband loved it and went back for 3rds! We will definitely make this again! After releasing pressure... Add 3 tbsp cornstarch, mix with hand mixer, and added cooked pasta to instant pot. Added some seasoned salt to taste. Otherwise pretty good.